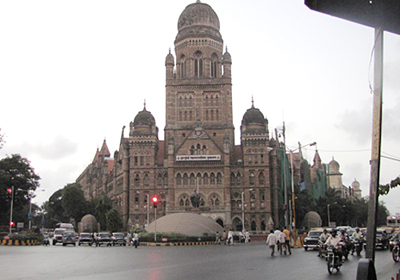 Mumbai is the capital of the state of Maharashtra located on the west coast of India. Combined with the adjacent cities of Navi Mumbai and Thane, its population reaches 19 million, making it one of the most populous urban areas in the world. Based on international financial flow, Mumbai is one of the top ten business districts in the world in which the headquarters of many financial institutions and Indian companies as well as the offices of various multinational companies are based. It also has the characteristics of a harbor city since its port handles over half the total maritime cargo of India. Due to a rapid population increase that accompanies economic growth, Mumbai also has a wide range of social problems, such as poverty, unemployment, poor medical services and a low standard of living and level of education. According to a census of 2001, 54% of the population live in slums, with over 1 million people concentrated in the Dharavi area, the second largest slum in Asia. The Mumbai office collaborates with the SPA (School of Planning and Architecture), whose headquarters is located in New Delhi, to conduct research based on the two phases as shown in Phase 1 and Phase 2. 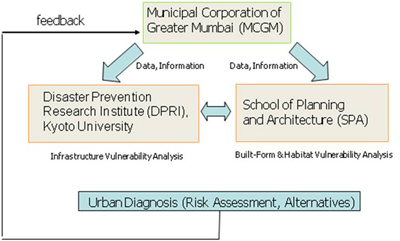 In Phase 1, the city of Mumbai, the SPA and Kyoto University cooperatively conduct integrated urban diagnoses of the city of Mumbai. 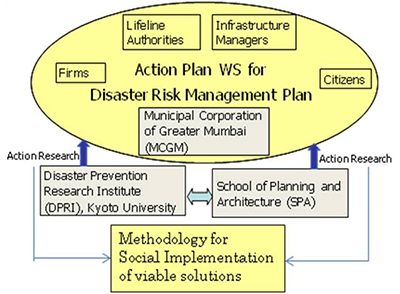 The SPA and Kyoto University jointly analyze the vulnerability of the city to disasters while laying emphasis on the process of providing feedback to Mumbai regarding its policies. In Phase 2, we propose prescriptive policies based on the analysis results obtained in Phase 1, and test them by putting them into practice. We involve stakeholders who play a part in the formation of a city in many workshops, and attempt to develop implementable action plans and deploy them.